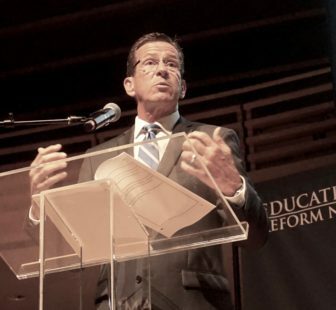 Gov, Dannel P. Malloy was a featured speaker before a charter school group in Philadelphia. Two national and regional charter school groups have created political action committees in Connecticut in time to make independent expenditures to influence a handful of the 10 Democratic primaries to be held next week for seats in the General Assembly. Change Course CT, a PAC associated with Democrats for Education Reform, a national group Gov. Dannel P. Malloy addressed during the Democratic National Convention in Philadelphia last week, has polled voters on two primaries in Bridgeport and one in New London. “We just want to know what the dynamics of the races are,” said Amy Selib Dowell, the Connecticut director of Democrats for Education Reform. She declined to say what they are doing with the polling data gathered in three districts: the 39th House, where Rep. Ernest Hewett of New London is challenged by Chris Soto; the 23rd Senate, where Sen. Ed Gomes of Bridgeport is challenged by Dennis Bradley; and the 126th House, where Rep. Charlie L. Stallworth of Bridgeport is challenged by Maria Pereira. In its filings with the State Elections Enforcement Commission, the group says it is supporting Soto over Hewett, Bradley over Gomes and Stallworth over Pereira. It had reported incurring expenses of about $5,500 as of Wednesday evening. Charters Care, an affiliate of the Northeast Charter Schools Network, reported spending less than $4,000 on literature and T-shirts promoting Stallworth over Pereira, an outspoken opponent of charter schools, and Rep. Terry Adams of Stamford over Dan Dauplaise. Chris Harrington, the treasurer for the PAC, could not be reached for comment. In addition to the charter school groups, Planned Parenthood also is making independent expenditures for the first time in Democratic primaries, spending about $14,000 sending mailers in support of two state senators, Terry Gerratana of New Britain and Marilyn Moore of Bridgeport. As CT Mirror reported Wednesday, the Connecticut Business and Industry Association is planning on spending about $400,000 in the general election on four Senate and 11 House races. The charter school movement, which was launched decades ago as a laboratory for experimentation in the public schools, has become a deeply polarizing force in Democratic politics at the local, state and national level. Himes, who was in the audience when U.S. Education Secretary John B. 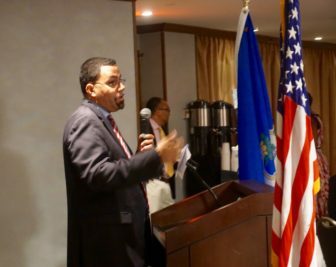 King Jr. addressed the Connecticut delegates to the convention at a breakfast last week, said the charter advocates erred by promoting their successes as evidence of failures by teachers. All charter schools in Connecticut operate as part of their local public school districts, with 22 run by private non-profits and one in New Haven run by the local district. Malloy, the co-chair of the DNC’s Platform Committee, was a featured speaker at a Democrats for Education Reform event in Philadelphia, even though the group’s president, Shaver Jeffries, complained of revisions to the platform negotiated by delegates for Hillary Clinton and Bernie Sanders. Mark Waxenberg, the executive director of the Connecticut Education Association, the state’s largest teachers’ union, said teachers believe that charters no longer are laboratories for innovations that can be introduced to the rest of the public school system. Malloy’s cordial relationship with wealthy backers of charter schools, some of whom are donors to the Connecticut Democratic Party, has complicated his dealings with teachers’ unions throughout his six years as governor. His first education commissioner, Stefan Pryor, was a co-founder of a charter school in New Haven. Jan Hochadel, the president of AFT-Connecticut, said funding at the state level for charters has to be seen as dollars unavailable for other other public schools. President Obama, who has declared a “National Charter Schools Week” each year he has been in office, proposed increasing federal funding for charter schools this year by 5 percent to $350 million. King, his education secretary, is a co-founder of Roxbury Prep, a charter school in Boston, and is the former managing director of Uncommon Schools, a non-profit charter management organization. In an interview after his meeting with the Connecticut delegates, King downplayed the conflicts between charter schools and teachers unions.